Websites are in existence since quite a few years now. With the passage of so many years and increased awareness, one thinks that the most common mistakes made then might have been curbed. However, that’s not really the case; even today we can see the most common mistakes being committed all the time. Below mentioned are some most common website design mistakes that you need to avoid in order to get best results from your website. It is true that people are attracted to the website when there are nice relevant images, but if it is overdone then it might have a negative impact on the visitors. Some web designers make the mistake of adding too many images to their website in order to attract the visitors, but in turn this slows down the response time of the website. Slow websites are a big put off for end users who tend to move on another website rather than waiting for the site to load. You are right; it is not cool anymore. This is one of the last things that people want when visiting your website. So rather than attracting people to the website design, the addition of music only makes people go away from your website. Research states that more than 70% people prefer a website where they need not struggle to find the things they are looking for. However, this is a mistake that many website design professionals make; and as a result, the business loses on valuable leads. If the visitors are unable to easily navigate the products or service pages before taking an action like buying or sending a query, they will doubt the credibility of the site. Another drawback is that with so many options out there why will they waste time finding what they need. They will move away to another website to get relevant information easily. Contact info plays a key role in establishing the credibility of a site. So, just including the contact form in the website is not enough because most people find this annoying. When people are looking for particular product information that they want to purchase immediately or have any query, they cannot wait for you to reply. They want to get immediate reply either through chat or phone. If the contact us page does not have relevant information then the visitors will get frustrated and won’t trust the website. Some people love colors and try to experiment with them, but doing this on a website design is so not cool. The color combination that you use on your website needs to be pleasing to the eye. However, some people experiment in the color combination and as a result most visitors who could be their potential leads move to another website to get relevant information. 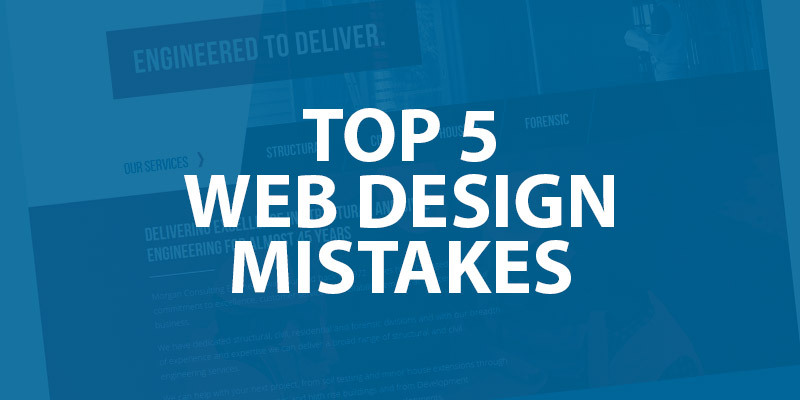 The above-mentioned are some top website design mistakes that many designers make today, and avoiding these mistakes will help you to get the best results from your website. To avoid website design mistakes, be sure to contact the team at m2media for your next Brisbane web design project.